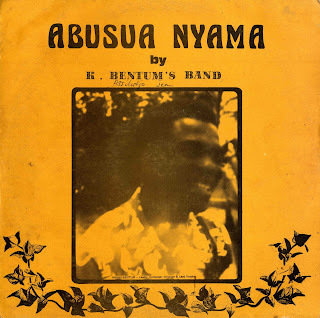 I do not have much information about this perfomer, but the song Tow Nkotow is off the LP Abusua Nyama recorded at the Ghana Film Studios and released on the Sole label in 1980. Kwasi Bentum is listed as the leader, composer, arranger and lead vocals and the style of highlife is called nzema highlife. It has the same spacey feel as some of the other tracks I have posted here, but the way the vocals play out in the tune stands out for me. The vocals really begin to take over about mid way through the track and the last part with the guitar playing is beautiful. it isn't downloading like the other recordings... and i have a mac. Very nice song. Thanks a lot!